A good mystery has a lot of moving parts. It needs to be well plotted enough so that the reader doesn’t solve the main plot too early, the characters have to be either likeable or despicable enough that we love to hate them, and there has to be enough meat on the bones of both to carry us into the world created by the author. That’s a lot to ask, and it’s surely the main reason that a lot of mysteries fall short. But what of those that don’t? The ones that leave us satisfied and entertained. Must they perfectly balance plot, character, depth, substance? Yes and no. 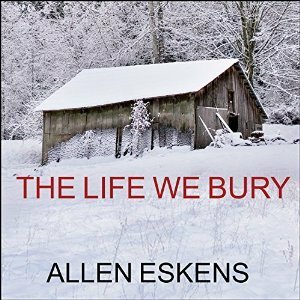 The Life We Bury by Allen Eskens is a very good example of a book that stumbles in a place or two but is able to make up for it by excelling in other areas. Our main character is Joe Talbert. He’s a college kid who has been given a writing assignment – one he’s been putting off for quite some time. He has to interview someone he does not know and write a basic biography. Not so hard. Joe decides to find an interesting person in a nursing home – figuring he will surely find someone with a story to tell. And he does, he finds convicted murderer Carl Iverson, on his deathbed and wanting to tell someone his truth after many years in prison. The premise alone is interesting – what is Joe going to discover from the man who murdered a young neighbor? You know it can’t be as straightforward as it seems – murderer wants to brag to writer before he dies. And it isn’t. But that isn’t what earns The Life We Bury my admiration. For the whole here is greater than the sum of its parts. Eskens creates, in Joe, a protagonist with history. Not some grizzled journalist, but a kid who has faced more adversity than most people will in a lifetime. Not outlandish adversity, but a drunk for a parent, a brother with special needs, and a lot of responsibility. Just getting to college was a big hurdle, staying there while working and managing the chaos back home makes Joe surly – exactly as he should be. He feels like a real person, stretched almost to breaking just by his everyday existence. When he meets Iverson, it’s just one more plate to spin, one more assignment to finish. But we all know it will be more than that. The mystery here isn’t the strongest in the world, and the coincidence fairy shows up a time or two to help move things along. But the well written character of Joe, and Carl, for the most part make up for those shortcomings. The Life We Bury ends up being very readable, with characters that stay with you for a while after you put the book down. To me, that’s a win. Eskens followed this book up with two others – The Guise of Another and The Heavens May Fall (see our review of that one here) – that bring back a couple of peripheral characters from The Life We Bury. I’ve now read two of the three and while they tie together, each can easily stand alone. Recommended for anyone looking for a decently plotted mystery with far better than average character development.